So, a funny thing happened to me on the way to this recipe. You see, when The Sriracha Cookbook first came out, a mention of Sriracha sangria somehow got on the press release, though I swear I’d never brought up such a concoction. Ever. But lo and behold, it seemed as though everyone was mentioning it: “Ooh! I can’t wait to try it!” and the like. The only problem was that it didn’t exist. 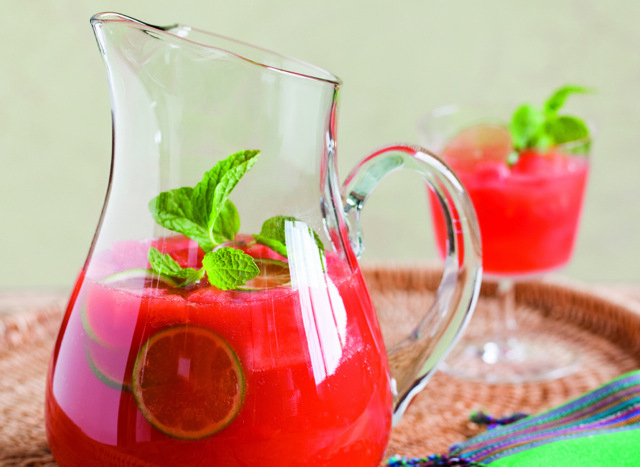 But now, in a delectable display of supply and demand, I made a rockin’ recipe for Sriracha sangria, with the wonderful addition of everyone’s favorite summertime treat: watermelon. It’s procrastination in a glass. When ready to serve, give the mixture a healthy stir, then pour in the ginger ale. Put a few ice cubes in each glass, then fill with the sangria, making sure to get some lime and watermelon goodies in everyone’s cup. Garnish with a sprig of mint and serve immediately.